Zirconia Dental Implants vs Titanium Implants - Which is the Best? When looking for replacement teeth, there are a lot of factors to consider. Due to increasing interest in holistic medicine and the concern of putting anything synthetic in our bodies, more and more patients are asking questions about the makeup of dental implants. For most patients, getting dental implants is a big step towards improving their oral health and so we understand that they want to make sure that they do the best thing for their bodies. Below, we will try to help answer your questions and in turn, help steer you towards the right decision. Zirconia vs Titanium implants – Which is right for you? Are Titanium and Zirconia Implants Safe? What is a Zirconia dental implant? 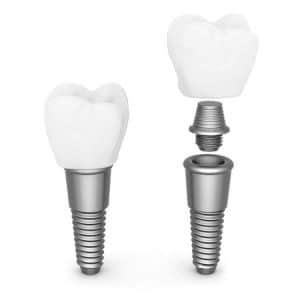 Dental implants are tooth root replacements, capped with a ceramic dental crown. 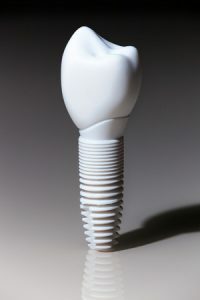 The crown (replacement tooth) is connected to the implant with an abutment. Zirconia implants are somewhat new to the implant arena. In the US, we have been using Zirconia for implants since 2007 (Europe since the late 1980’s) while we have been using Titanium for dental implants since the 1960’s. Both materials are biocompatible offering high acceptance rates with the body promoting Osseointegration which means bone can grow around the implant material just as it does around our natural tooth roots. Currently, most FDA approved Zirconia implants are one piece. This means that the synthetic tooth root and the abutment are connected whereas they are two pieces with Titanium dental implants giving the dentist more control over a few elements of the entire implant placement process. Zirconia is best known for its likeness to diamonds. It is a crystal material that is altered slightly when used in implant dentistry to give it a tooth color. Zirconia is the crystal form of the transitional metal Zirconium and Zirconia implants are often marketed as “metal free”. When the zirconium is treated, stabilized and converted into its crystal phase, it becomes a ceramic so Zirconium Oxide, otherwise referred to as “Zirconia” technically can be called, “metal free”. Due to the rise of concerns over Mercury used in dental fillings, some patients are partial to the idea of keeping metal out of their mouths entirely. Titanium has been used in the medical industry for decades. In addition to dentistry it is commonly used for hip and knee replacements. Titanium is a metal that is strong, lightweight, non-toxic and corrosion resistant. Dental implant’s made of titanium have a long term success rate of about 95%. Some patients have had their titanium dental implants in great condition for longer than 30 years. 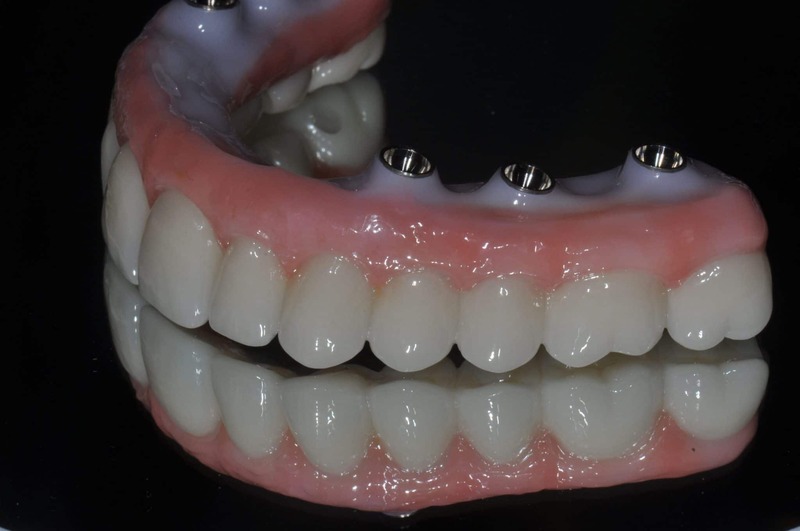 Alternately Zirconia hasn’t been used in dentistry long enough to understand its long-term success and the styles for Zirconia are continuously changing. For example, when placing Zirconia, most dentist’s use a single piece Zirconia implant but eventually more two piece styles will be FDA approved giving dentists more freedom with placement but they will have had less experience with it. Can someone be allergic to their dental implant? It is rare to be allergic to a Titanium dental implant and there are no documented cases of being allergic to Zirconia. Titanium dental implants are usually made of Titanium Alloy which is a combination of a few metals including small amounts of Aluminum, Vanadium and Nickle. The few people who have been allergic to Titanium implants are usually allergic to the small amount of Nickle which is found in Titanium Alloy. Patients with a history of metal allergies are encouraged to take the MELISA Test (http://www.melisatest.com/) prior to having a Titanium implant placed. Are both Titanium and Zirconia safe materials to have implanted in the jawbone? Both options of implant materials are biocompatible, FDA approved and considered safe. This means that they interact favorably with the human body and are non-toxic. Small traces of the Titanium Alloy may become present in the bloodstream but the past 50 years of study has shown it to cause no adverse reactions. (The only exception being if the patient is allergic to a metal in the alloy.) Zirconia is also biocompatible, hypoallergenic and does not seep into the bloodstream. Getting dental implants regardless of the material increases risk of gum infection until the site has healed properly. There are some arguments that two-piece implants have a higher chance of harboring bacteria while single piece implants require dental cement which also can collect bacteria so neither are safe from developing plaque. Can both materials be used for a mouthful of replacement teeth? If a full arch or full set of teeth are to be replaced, Titanium implants are the better choice. Since Titanium implants are made in two pieces, a dentist has more freedom to make small alterations to the angle of the abutment. This means that the smile line look and bite alignment will feel more natural. Whereas, with single piece Zirconia implants, angles are much harder to customize as the abutment is stationary not allowing the dentist to customize the position. Are Titanium implants better than Zirconia? There are pluses and minuses to each type of material and we would recommend a certain type of implant after listening to our patient’s concerns and goals. Below are a few categories most often analyzed when deciding between the two. Cost – The cost to manufacture zirconia (think cubic zirconia jewelry) is higher than titanium so zirconia implants will cost patients more money. The cost to the dentist for a Titanium implant is typically between $300 and $500, whereas Zirconia implants range between $500 and $600. Please note that this is for parts only, this is not the cost to the patient. The implant including consultation, imaging, mapping, materials, surgery and after care check-ups usually cost patients between $3000 and $6000 per implant. Insurance companies often do not cover dental implants however, more and more we are seeing dental insurance covering a portion of the costs. Osseointegration and Soft Tissue Healing – Both Zirconia and Titanium implant materials are biocompatible and integrate well with the bone and gums. Titanium implants often last for 20 plus years while Zirconia is still under research as it has not been used long enough to tell long-term success. Older Zirconia versions have been known to fracture requiring new implants. Some Zirconia manufacturers will scare patients into thinking that Titanium will cause a shock or a piezo-electric current if there is any other type of metal in the mouth. However, this concern is fairly unfounded as we have not found any documentation on this ever being a problem for patients. Ease of Placement – Titanium implants have been the standard in care for tooth replacement for quite some time as more people are turning to them instead of dentures for multiple tooth replacement. Titanium implants have become a very common dental procedure and are considered easy for a dentist to place without complications if bone density and bone health are good. 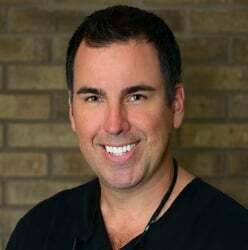 Successful surgical placement of Zirconia implants has proven to be more challenging. Most Zirconia implants are single pieces (both implant and abutment in one solid piece) which cannot be placed completely under the gums and are difficult to place at an angle. Being able to place the implant at a slight angle is important to the dentist because occasionally, due to bone density and teeth profile, an implants optimal position is slightly off centered. There are newer two piece models out that should be more easily placed however they have not yet been widely tested. Aesthetics – For most patients, Titanium produces great results. However, some patients are concerned about developing a visible grey line under the gums or along the tooth ridge. If patients have thin bone or gum tissue, the abutment of the dental implant can be made of ceramic so that no grey metal will show through. On the other hand, Zirconia is known for its aesthetics. The beautiful white tooth color of the ceramic material looks very natural and does not show through gum tissue. Strength – Titanium implants are incredibly strong, have high flexural properties and resist fracture. Zirconia has a lower elasticity which can lead to more micro fractures, but is also very hard and strong. With so much information regarding both Titanium and Zirconia dental implants, it is no wonder many patients have a difficult time deciding which material they prefer. Most of the time, I recommend Titanium dental implants to my patients and I would opt for Titanium in my own mouth. Titanium dental implants have served the medical and dental industry for many years. They are reliable and well proven. Although Zirconia implants show promise, their long-term success is not proven. If, aesthetics or allergy sensitivity is what is driving you towards Zirconia, a Zirconia abutment with a Titanium implant may be the best solution. For more information about dental implants or to see if you are a candidate for implant dentistry, please give us a call at (941) 929-7645 to schedule a consultation today!